Today’s Sustainability Communications Lunch put the spotlight on social media and particularly its use for NGO communications. Our guest speaker was Julian Ferguson, Communications Manager of the European Cyclists’ Federation (ECF), an association which promotes biking as a daily mode of transport. Sporting a very fine Movember moustache, (despite it now being December…), Julian shared ECF’s approach to social media in an extremely interesting and interactive session. The key question behind all communications, according to Julian, should be ‘Why?’. Why am I going to blog on this topic? Why am I writing this tweet? Julian shared some golden rules for social media. 1/ Be regular – You need to be consistent with populating social media platforms. ECF does around four posts a day on Facebook and four or five tweets per day. At the same time, you don’t want to flood people with information so the right balance has to be found depending on the organisation. 3/ Social media is not a megaphone – You have to interact with people, it’s not advertising. People are interested in posts because of the content and the first 44 characters of a tweet are the most important. Using direct quotes, humour and photos are all good ways to generate discussion on social media. 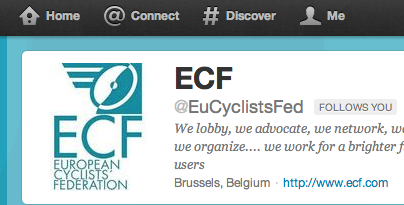 You can follow ECF @EuCyclistsFed and Julian himself @Julian_Ferguson. If you are at all interested in biking, these are twitter feeds to follow. 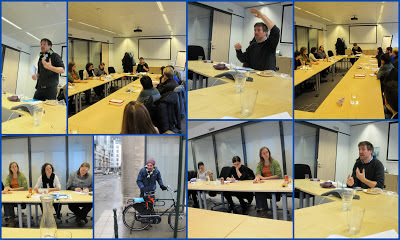 Today was the 10th Sustainability Communications Lunch. We would like to keep this interactive approach going for the next Lunches. It’s like a mini training in a lunch hour. The next Lunch will be on Monday 28 January. Keep an eye on our Facebook page and our Twitter @Sustconsult for more details in January or contact lunch@sustainabilityconsult.com.